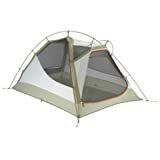 The Mountain Hardwear Light Wedge is a 2 or 3 person 3 season tent. The Light Wedge features a functional wedge shaped design instead of the standard dome tent. A brow pole over the vestibule increases space for gear storage. 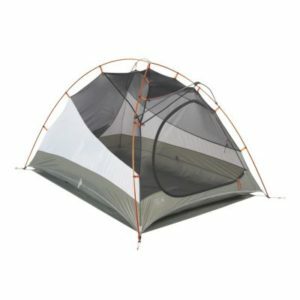 The tent features a 43″/50″ (2pp/3pp) interior height and a 3 pole setup. It is possible to pitch just the vestibule with the footprint for an ultra light carry. The tent weighs 5 lbs 6 oz/6 lbs 4 oz (2pp/3pp) when packed. Hikers and campers give the Mountain Hardwear Light Wedge high marks. One hiker reports taking the tent out for a 3 day excursion in Colorado. He reports that the tent stayed dry even though it rained every day. He added that there is plenty of room for 3 people in the larger model but does recommend buying a compression sack for carrying. He also recommends buying some extra stakes if you want to stake down all the guy lines.